History reveals that life was a big circle, curves and spirals when we visited Newgrange, Co Meath, Ireland. The place of the prehistoric site built during the Neolithic age 3200 BC. 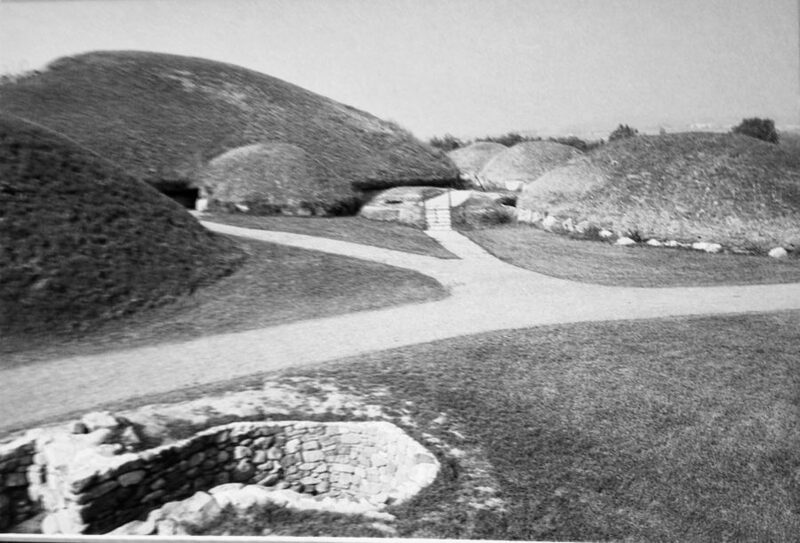 According to archeology, the mounds are older than the Great Pyramids of Egypt and Stonehenge of England. As much as I want to remember the name of this area, it’s something Gaelic that I cannot pronounce such as Knowth and Dowth, the names of two more prominent mounds amongst the many smaller ones in this field. Newgrange was build before the Iron age where there were no metals, only huge stones. 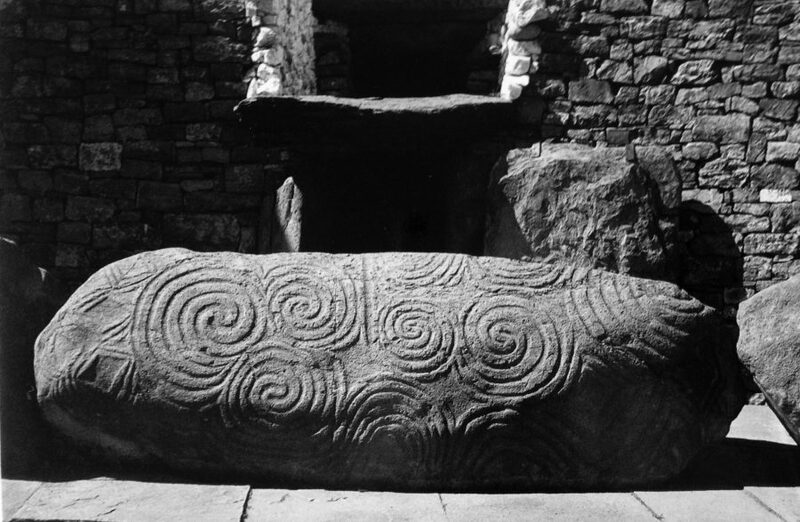 This rock is decorated with spiral coils carvings sitting in front of the entrance. Legend says that these mounds are burial chambers. Should you wish to witness the event, it is by lottery only. This is the curveball. There are very few benefits in winning this lottery to observe the solstice since it’s weather permitting. I remember very well when I was there, it was soaked in. 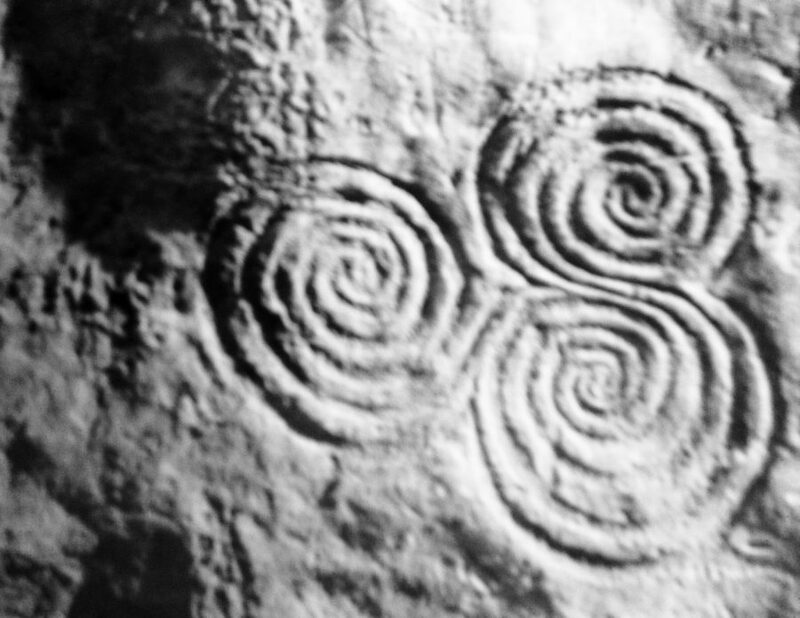 A close-up look of the three spiral design is a famous Irish Megalithic symbol. It is often referred to as a Celtic design. There is no need for me to win the lottery since I felt that I have won already by being there as I have dodged the curveball. The only curve I would want to experience is the smile on my face every time I remember traveling with my best buddy at the Mystical and Mythical Ireland. This entry was posted in Challenges, Ireland, Pilgrimage, Travel and tagged Circles, Curve, Ireland, Lens-Artists, Newgrange, Photography, Travel, winter solstice by Perpetua. Bookmark the permalink. Beautiful place. 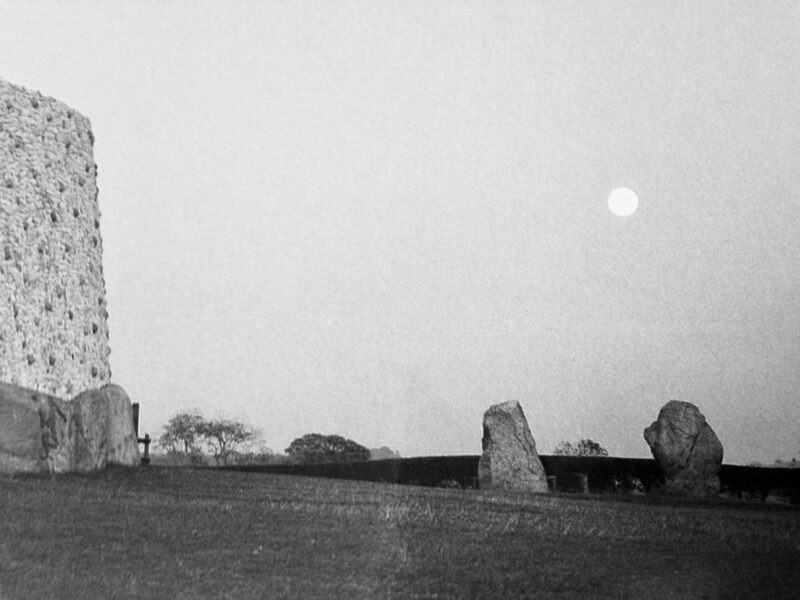 I spent a lot of my life living in Wiltshire where they have a lot of Barrows, the burial mounds, Avebury stone circle and of course Stonehenge. It’s amazing to see this in Ireland, so similar yet so far away at that time. I love the carvings as well. Wouldn’t it be cool to try something like nowadays. That’s an idea. How on earth will be able to acquire land in UK to create a mound of burial. The stone age is gone and cremation is the in thing. I mean the stone carving. It just made me think I wouldn’t mind learning how to do it. It seems a very permanent art form, it lasts for thousands of years. I still have a stick somewhere my Dad carved for me when I was a little boy. I have never really been a great artist, but will do a little research on tools and techniques I think. Maybe one you’ve done your research, you and your boys can do carvings similar to the Aboriginals. Oh, you are a Kiwi. My sister is married to a Kiwi. I think the kids are dual citizens and they continue to visit their ancestry in New Z.
I can’t believe you thought I meant building a burial mound! I am more into the flaming viking boat if I had a choice. Sail off to Valhalla! That would be cool, but not anytime soon! Can you imagine the planning permission you would have to get to start burying bodies in a mound in the middle of a field nowadays. Sorry I can’t stop laughing writing that. Oh how the world has changed. That is hilarious …. bwahahaha …. laughing hard! History reveals that life was a big circle, well said. Thank you for your insights. I didn’t know about Newgrange, so glad I learn it from your post. All are magnificent. Yes,… you have won already by being there!! Thank you so much for this post! Got to include this in your bucket list, Amy. This site is so interesting considering that I have visited various historical sites. Ireland is rich in history. I don’t recall I have heard or read about it. Ireland is on my list! 🙂 Thank you, Perpetua! My friend bought a book about Ireland and with Google it would virtually take you there. It’s such a beautiful place. I love ancient stuffs. I’m sure that if I have chance to visit it, I could stay forever. NFL, Ireland is filled with ancient history and it’s all over the place. Please do visit while you can and skip all the tourist spot. Walking around will take you to surprising mounds and beehives. Thank you, Tina. A very dark entrance. I enjoyed the story and the wonderful photos. Black and white photos accentuate the designs! The circular art on the stones are in sky charting observations. Was common discussion among ancient people, in that they understood the above moving in circular cycle patterns; and the experience of their own existence with the nature of Earth in cycles. The many spiraling circles on one stone signifies a learning area.